Effective health care begins with an accurate diagnosis. 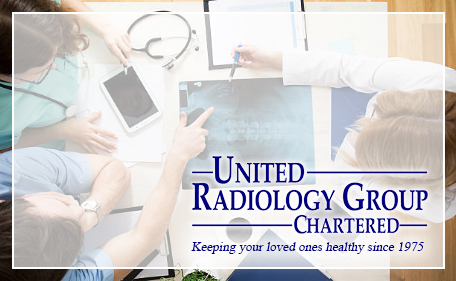 The highly trained and skilled radiologists of United Radiology utilize comprehensive procedures to deliver a timely and comprehensive assessment using industry-leading imaging solutions, allowing your health care team to deliver the services that will return you to good health. Our mission begins with a strong commitment to provide superior imaging technology and services. When your health is compromised by illness or injury, our radiologists are the first step in your path back to good health. Like our patients, we are residents of central Kansas. We are committed to health in all our efforts, and offer our professional diagnostic services to maximize your health, your neighbor’s health, and ultimately, to the health of our region. We have been serving central Kansas since 1975, and look forward to continuing our professional and neighborly presence here for many years to come. In today's world of big-business medical care, it's nice to know you can turn to somebody who really cares about your health... and who's been there for you, your family and your friends and neighbors for nearly 30 years. Actually, it comes pretty natural to all of us here at United Radiology Group, because we're your friends and neighbors, too. James E. Peterson, M.D. Ray E. House, M.D. William B. Garlow, M.D. Arnold R. Cabrera, M.D. Pamela Braxton Davis, M.D. John Riekhof, M.D. Patrik Leonard, M.D. Robert Haller, M.D. The information transmitted by the above e-mail addresses is intended only for the addressee and may contain confidential and/or privileged material. Any interception, review, retransmission, dissemination, or other use of, or taking of any action upon this information by persons or entities other than the intended recipient is prohibited by law and may subject them to criminal or civil liability. If you received a communication in error, please contact us immediately at (785) 827-9526 and delete the communication from any computer or network system. Although email and any attachments are believed to be free of any virus or other defect that might negatively affect any computer system into which it is received and opened, it is the responsibility of the recipient to ensure that it is virus free and no responsibility is accepted by the sender for any loss or damage arising in any way in the event that such a virus or defect exist. United Radiology is dedicated to serving the diagnostic needs of rural Kansas. The mammography coach is an integral part of our commitment to rural hospitals and clinicians of Kansas. 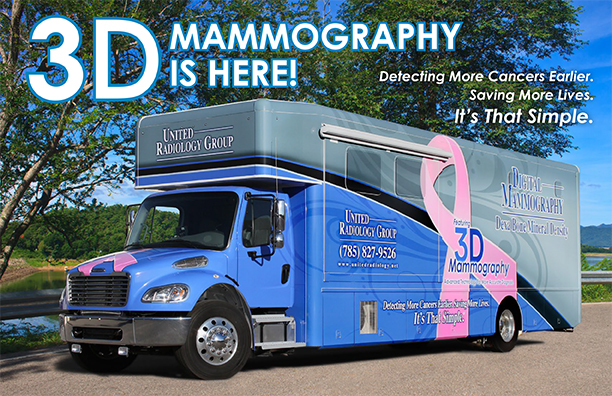 We have increased our services and deepened our commitment to these rural Kansas clinics and hospitals with the purchase of a new 3D tomosynthesis mobile mammography/Dual Energy X-ray Absorptiometry (DEXA) coach. of breast tissue in a flat 2D image.